WASHINGTON—The U.S. Secret Service announced Wednesday that the White House has upgraded its security procedures following a recent incident in which Donald Glazer, a 51-year-old man who had no prior appointment scheduled, showed up unannounced at the Oval Office looking for President Barack Obama. “Mr. 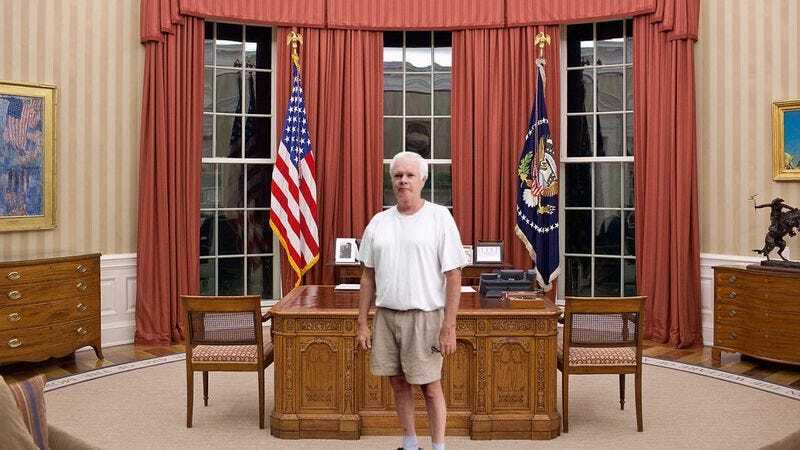 Glazer waited by himself for 45 minutes, milling about the empty Oval Office and idly thumbing through the materials left out on President Obama’s desk while waiting for the commander-in-chief to return,” said Secret Service Director Julia Pierson, adding that while Glazer wasn’t threatening or armed, he should not have been able to enter the White House through a staff access door, walk through the Rose Garden, enter the West Wing, say “I’m here to see Barack Obama,” and be let into the Oval Office. “From now on, we will be maintaining a visitor log that all White House guests will be required to sign before being permitted on the premises, as well as installing metal detectors at several key entry points. Additionally—and this is of the utmost importance—we must make an effort to keep all doors and gates to the White House locked at all times. No exceptions.” Sources later told reporters that Glazer wanted to talk to Obama about getting E-ZPass booths installed along Nebraska toll roads.